Each night—no matter the season—George and Roxy seek refuge beneath a St. Paul bridge. “It gets a little windy down there, but we’re okay,” he said. 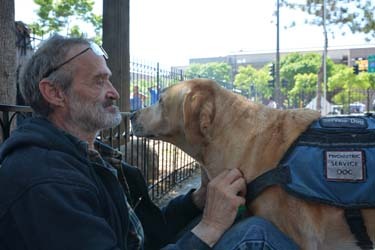 Roxy is George’s constant companion, his protector and his psychiatric service dog. They stay together in the heart of the city, near a park and close to Catholic Charities’ Dorothy Day Center. The chaos and crowds of Dorothy Day Center don’t provide the peace George seeks each night. He said sleeping outside with Roxy is his best option, for now. “I’m bipolar and manic depressive. I have seizures; she helps me with that. Roxy is my shrink, my psychiatrist, my best friend,” he said. Dorothy Day Center guests and staff have become fans of Roxy. She’s often seen relaxing in the courtyard with her bowl of water. Her mere presence seems to make people smile. George and Roxy go to Dorothy Day Center with two things in mind: hunger and hope. His hunger is appeased by the meals he eats there, and George gets hope when working with the Housing First staff there that one day, hopefully one day soon, he and Roxy will be able to find a home of their own. Ethan Williams works with Catholic Charities’ Housing First program. He is working to find a home for George and Roxy. “George is a perfect example of those rare cases where a person may have become homeless years ago for substantial mental health or chemical health disorders, but have since, for the most part, resolved them and are awaiting their break out of homelessness,” Williams said. Catholic Charities’ Housing First program works to support people who have experienced homelessness to gain permanent housing. Housing First is a national model that delivers services in a more dignified and compassionate way by providing people who are experiencing homelessness with the stability of housing. By forging strong relationships with Twin Cities’ landlords, Housing First provides people like George a chance to get into a home when they wouldn’t be able to do it on their own without positive rental or credit history. Housing First not only helps people like George find a place to live, but provides follow up services and rent subsidies as they work to maintain self-sufficiency. While the winds may howl under that bridge, George is patient and thankful he has help finding a home. “I’ve been homeless on and off for about 10 years. Hopefully we will have a place soon,” George said.